Armed with those goals it is now necessary to plan our progression over the route. Average Pace is a Myth! a Silver would require running at 4:56 per km – Bill is 5:56 per km – a bronze with 7:15 per km and the Clapham at 7:41 per km to avoid the CMA mid route cut offs, and to make up the delay in start. Race founder, Vic Clapham had other plans in 1921 though, and chose a challenging mountainous course that has no flat until the finish. If we use a 10:00 hour runner as an example the average pace is 6:35 per km, but in the first section those hills and drops will see him or her running between 4:50 per km on steep down (only 200m or so) and over 10:12 per km (probably lots walking) on steep ups – and that before even reaching the highest point!!! Nowhere does the runner get to run 6:35 per km, and any attempt to take that approach is Comrades Suicide!! Maintaining average pace is a myth – comrades is about even effort! In the previous article we touched on the required accuracy of pacing. A difference of 9 seconds per km could result in a 14 minute difference in the finish. This is the sort of stat that seems to promote the use of minutes per km as a means of ensuring your goal – BUT it is not. Many runners will not know that the first time ANY km marks were put down was in 1972 with 5km intervals for the last 25km of the race only. The course was measured by a car in 1975, and it was only in 1986, that Wally Steele and I, measured the course to the official method and standard for the first time. That measurement knocked over 2km from the previous ‘official’ distances obtained by a surveyors wheel! 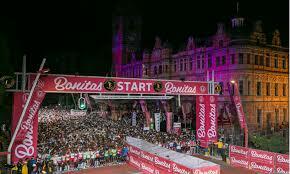 So how did the 25,000 Comrades finishers of previous years pace their race? Certainly not using mins per km along the route (or miles in early days). Instead they ran from landmark to landmark in set times, using their perceived effort as the measure. Today’s runners rely too heavily on the technology and not enough on the feel of the run, and this sets them up for failure. As with driving a hybrid car its about consistency of effort to get the maximum from the fuel tank, and it requires discipline, judgement, and patience, all the things Rudyard Kipling expressed in his poem IF. 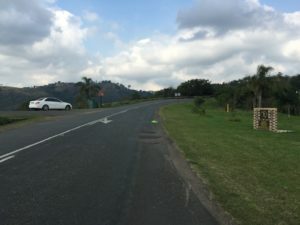 The runner who acknowledged that comrades is an all-day picnic, moving from landmark to landmark, has a greater chance of success than anyone working out pace between points. 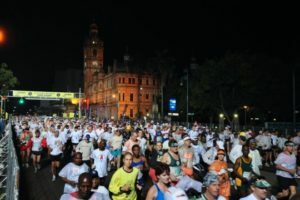 a 10 hour runner has 40 minutes to cover the section which means around 7:45 per km, but that is meaningless, as the drop and climbs sees the runner speeding at 5:40 per km and grinding up Alverstone at 10:10 per km! Kipling holds the key – from the very start – keep your head, (while others are flying off all around), don’t doubt your ability, and have patience (it’s a long day ahead), and ease and relax your way along the route, conserving energy at all times. Use the landmarks as guides to your progress: So if my pacing chart says be at half way in 5 hours 11 minutes and I arrive in 5:09, I am pushing too hard, so ease back on the next section and if I arrive in Botha’s Village at 5:53 I have taken too long for that section so I gently increase the effort. The muscle fuel (glycogen) is limited, and once used the ONLY way to refuel is (as with a hybrid car) to stop and fill up. The car fills with petrol, the body fills with hi-gi carbohydrate (read the history of Johnny Halberstadt’s up run to see this in action). Those energy drinks and squeezies do not provide fuel for the muscles if the muscles are still in use, but rather a) maintain blood sugar level and b) prevent the mind from dragging carbohydrate from the muscles to power the brain. The longer the distance, the lower the running intensity, the more the runner relies on metabolised fat for energy, which is akin to the hybrid battery power, (This is why we focus on long runs in training). 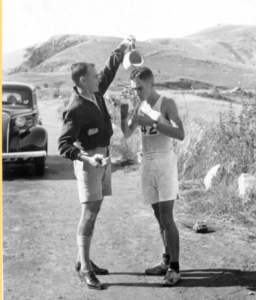 The tie to a banting type diet, and the reason that a Gold Medallist uses totally different fuel from a 10, 11 or 12 hour runner, becomes obvious. It is the reason some runners believe they have to go off fast to ‘put time in the bank’ for a slower 2nd half, but it is the reverse that is true! It’s a self-fulfilling prophecy – if you go fast – you use too much energy in the first half and therefore are forced onto battery power in the last section, unable to make meaningful progress. If you are cautious in the first half and conserve energy to 70km, then you have energy to maintain pace, and even pick up effort (not pace) in the last section. Don’t take my word for it – just look at the winners for the past 3 decades and more – even Arthur newton in his first comrades up of 1922, only took the lead at Cato Ridge! Up or down run, it is the same, as the up hills are in the first section and the down in the last! When the gun goes we are filled with energy, excitement, and anxiety: we just want the day to begin and to get moving. This is all aided by the downhill to Duzi Bridge, and exacerbated by running in the dark. A 10 hour runner will cover this first section in say 23 minutes 30 seconds, (average pace 7:48 per k) but if he arrives there in 22:30 (7:30 per k) then his projected finish is 9:40. Although only 18 seconds per km, this is too fast and the energy is already being over-used. This starts the self-fulfilling prophecy – YOU ARE going to grind to a halt in the final section!! Rather then, start slower – and even if you were delayed minutes at the start – don’t try to catch them up early – start the catch up from highest point. Finally we need to understand time management of the race: there is Faster, (on the downs), there is Slow, (on the hills), but there must never be stop or reverse! Never go back – any step backwards (to pick up a cap, or collect something from a second), is a double error and distance – a metre to go back and another to get back to where you were! 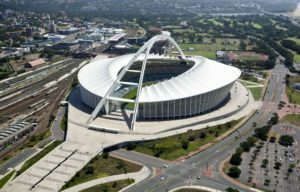 If you stop, you endanger your Comrades medal and finish … keep on moving, no matter how slow and always, but always, in the direction of Durban… Success will be yours when you receive your small, but prestigious medal in Moses Mabhida. “If you can fill the unforgiving minute with 60 seconds worth of distance run….